The wood shop is up and running again after almost a year of down time. The first item out is a variant of the PzVG with improvements including a lighter weight and slightly smaller footprint. The wood is solid African Padauk with charcoal or black micro suede surface. 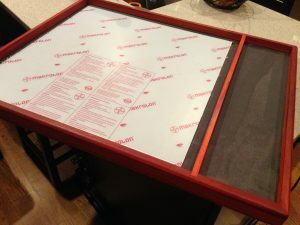 There is space for 12 x Raaco A75/A78 trays so you can have informationals handy while you play. I am making 6 pieces total in this run. Shipping to the ConUs is included in the price. ‘Where the Iron Crosses Grow’ team tournament is only a week away. 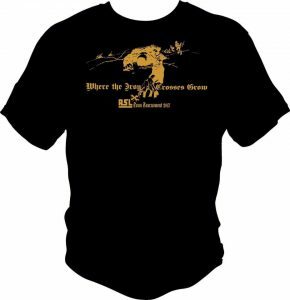 This year we will be doing Gold on Black t-shirts. They will be available at the special price of $10 at the tournament or $15 to shipped to you (2X $18). Order by clicking on size. 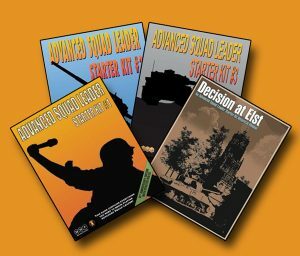 I have created the Group ‘Advanced Squad Leader Starter Kit’ on Facebook for those of you that want your own arena to post and ask questions in a strictly SK forum. It is an open group so you don’t have to join to read the posts, but we would be happy if you did. Please copy and paste the link below or click on the image below. 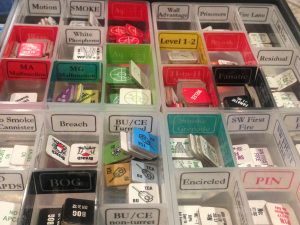 Below is a short video on the process I use to label my counters. The label maker in the video is a Brother PT-2730. You can use other label makers but I suggest that you get one that can be edited on your pc so you can insert nifty images. 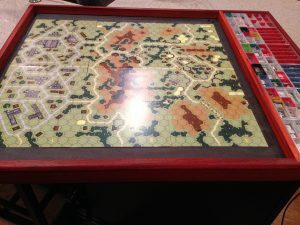 Q – Are BattleSchool Dice truly precision Dice? A – Yes and No. 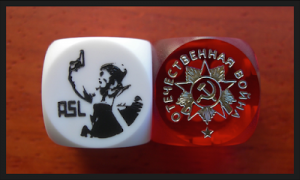 While no dice including backgammon dice are infinitely precise, the Battledice are much more precise than the stock dice that are supplied with the core ASL modules for two reasons. 1. 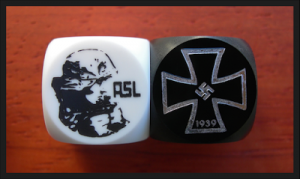 The Battledice blanks are produced at he same factory and to the same specs as backgammon dice. 2. The pips in non precision dice are drilled out without being filled in with equally dense material. Because of this, the ‘one’ surface will be heavier than the ‘six’ surface as the six surface has 6 times more material removed from it. If true precision is your desire, please check out the backgammon dice that we carry as well. Q – Why are they so expensive? A – This is a matter of perspective. Although it seems like $10 a die is an exorbitant amount to pay for a little square piece of plastic, in comparison to backgammon dice, they are very reasonably priced. True backgammon dice run from $20 to $35 a pair. 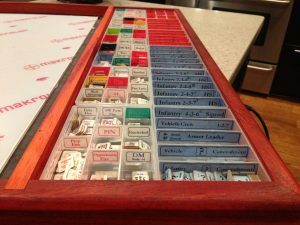 The Battleschool dice, which are backgammon dice to begin with, then custom made in small batches with great WW2 themes, are around the $20 mark for a pair. Q – Are they necessary to play the game? A – No. While none of the dice are truly needed to play, they do heighten the enjoyment for myself and others. 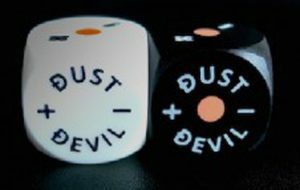 If I had to pick one set that was the most useful I would say the Dust Devils, hands down. Q – Why do people collect them? A – I can only speak for myself but I will say this this; When someone asks me if I need Polish dice to play a Polish scenario, I say ‘no, but then again I don’t need a new action pack filled with 8 more scenarios to add to the 5,400 scenarios that I have yet to play either, but no one gives you grief about that, do they?’. The dice make me happy, so I buy them. It’s really that simple for me. Where the Iron Crosses Grow team tournament less than a month away now. We although players always have a choice on scenario selection, this year we will also have some themed rounds that are completely voluntary. Also, Saturday night, we will be having a viewing of the Estonian movie ‘1944’. I already had a chance to see this movie and imho, it was fantastic. I am really looking forward to getting everyone’s opinion on it.